* Make checks payable to " Shout The Gospel ". Ian's testimony can now be down loaded into your Kindle from Amazon. It costs around $0.99 USA to get the down load this covers Amazons commission. Please click on the link to view it & if you like it please could you be very kind & write a review on it. This will help. 2. " 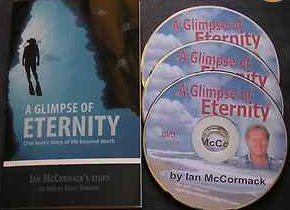 A Glimpse of Eternity " - Download a book by Jenny Sharkie (120kB) in Microsoft Word format. If you wish to view this file click here. - Shortened version of my testimony as we find it on my web page. Ambulance - Back to earth .